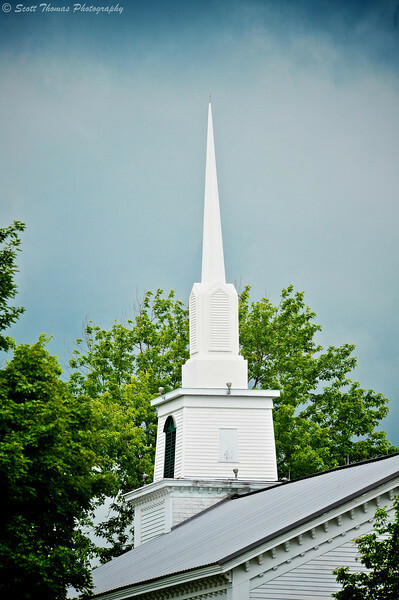 The steeple of the old Methodist Church in Fabius, New York was built in 1860. The white church is now home to a nursery school. Nikon D700/80-400VR, 1/400s, f/10, ISO 800, EV +1.0, 310mm focal length. While walking in between baseball fields last weekend I spotted the steeple of an old Methodist church in Fabius, New York. The current structure was built in 1860 and houses a nursery school today. Small towns and villages in rural areas of the United States have simliar places of worship. This entry was posted in Weekly View and tagged 80-400mm, architecture, building, church, fabius, history, new york, nikon D700, old, Photography, religion, steeple, vr, white. Bookmark the permalink. Telling details in that image. Civil War veterans attended that church–and I’ll bet some of them migrated to northern Michigan to take up homesteads . . .
Quite possibly, Gerry. Winters could not have been tougher than those this church has survived. What a nice contrast between the sky and steeple. You’ve captured the ‘holiness’ of the structure, if such a thing can indeed exist. It’s odd how so many churches are finding a new life in communities both in the US and Canada. Once a building is considered a sacred space, I wonder what kind of effect this has on future tenants. For example, does it make them act more reverently while working within that space? I like the angle you chose to present this old church. An interesting style of architecture, a whiteness in a blue sky that blends in beautifully with the spirit within.